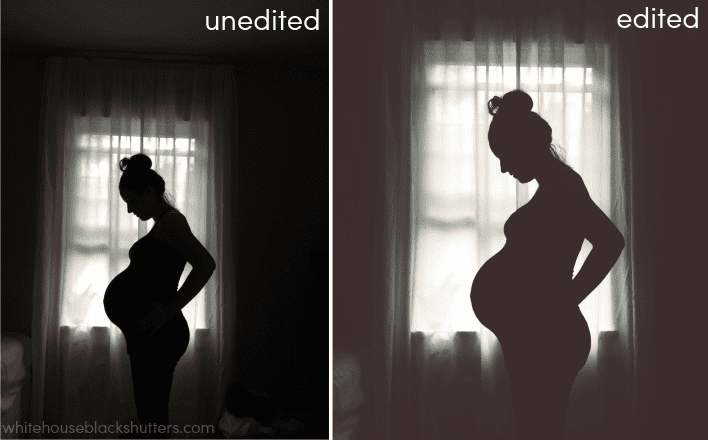 How to Take a Pregnancy Sillhouette Photo with Your Phone! 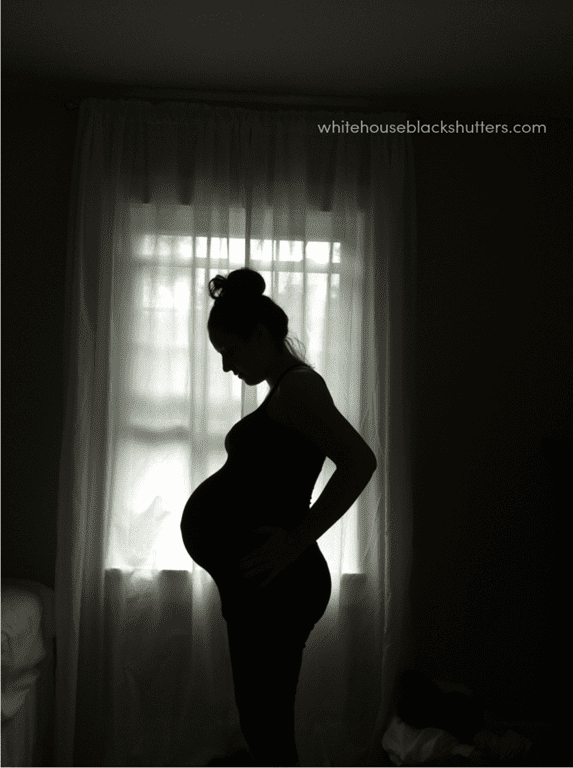 When I was 36 weeks pregnant I wanted to recreate this picture from Kelly Hicks Photography. Before whipping out my fancy camera, I thought I’d see if I could get a similar look with my iPhone. And sure enough! With a little bit of work, apps, and an iPhone camera (an outdated 4 at that ;)), this is what I got. Every week I post a bump shot, but today’s 36 week photo got quite a bit of a response on facebook and instagram. 🙂 And many of you wanted to know how I captured it. It wasn’t as hard as you might think, here’s what to do! Afterlight, 0.99. Best .99 you’ll spend on an app. Hands down, my favorite for editing. Get it. NOW. UPDATE (4/15/15)!!! Newer iPhones 6, 6+, 6s, and 7 have “burst mode” with a 3 or 10 second timer. It will take a whole bunch of pictures when the timer goes off and you can choose one to save to your camera roll from there. The quality seems to be slightly better than in the Afterlight app. You want your silhouette to be as simple and clean as possible. Try to wear clothes that eliminate lines and bunching. You’ll need a window with natural light coming in, preferably with thin, white, or sheer curtains closed to filter the light slightly and create a soft glow. Here’s the before and after of my picture: The one on the left still looks good and didn’t NEED to be edited. But the one on the right?! It evokes a hazy, dreamy glow. The tilting and cropping help draw your eye to the person, rather than the bed or the laundry on either side of the picture. 😉 Not bad for an iPhone camera! Pin to save these directions for when you need em! Try it out for yourself, have fun with poses, or add your kids, pets, or family to the mix. I’d love to see it if you try it out, so feel free to email me, comment here, or tag me on Instagram (my handle is @whbsblog) if you post on there! Since this was posted almost 4 years ago, I have heard from hundreds of moms who have used the tutorial with success. When I wrote it, I had taken my picture a few minutes before and had a lot of people asking for a tutorial, so I rushed to the computer and hurriedly wrote this post. 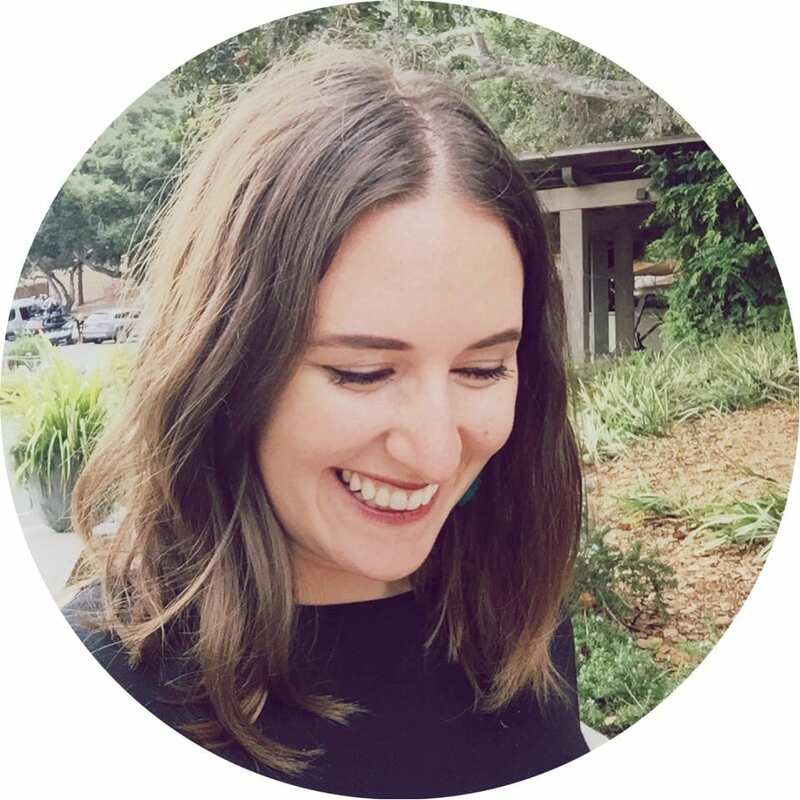 🙂 I had no idea this post would still be popular so thank you for reading, pinning, trying it out, and sharing it with friends! I still cherish this picture. I followed your tutorial step-by-step and ended up with a beautiful photo that I will cherish forever. Thank you so much!!!! Afterlight is also available on Windows! 🙂 (not sure if anyone posted that yet). I have downloaded the app, Afterlight. I’m playing with it but can’t get it to work. Do I have to download the camera+ app as well? I have an iPhone 5. Anyone? Thanks in advance. I think this is the first Pin that I ever actually followed through on– and it worked GREAT! I am so happy with how the photo turned out, thank you thank you! I did it at 38 weeks. I also figured out that you can use the new iPhone 6 and you don’t have to download Camera+ if you don’t want to– there is a 10s timer in the camera app. Thanks again, great post! Thank you for this!!! 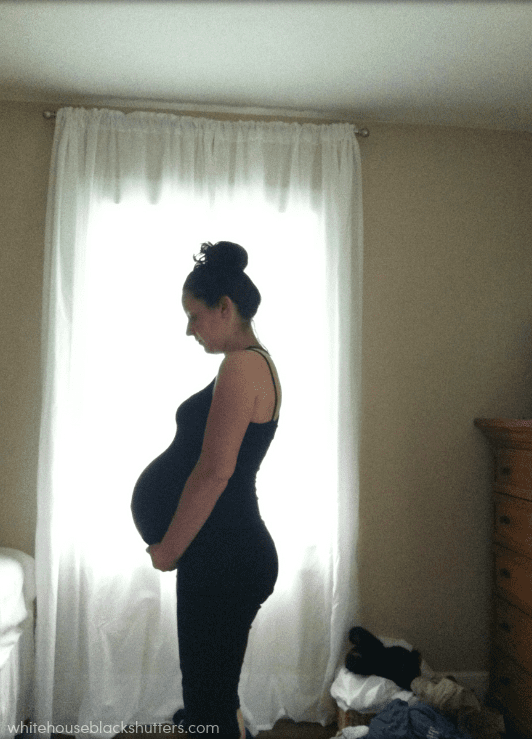 I’m 11 weeks pregnant with a baby via surrogacy for a family. I did this today. This will be a wonderful gift for them. Thank you so much for this idea and tutorial! What a special picture I’ll have to remember this pregnancy with my son. I’ve already shared your blog with a few pregnant friends that plan to use this tutorial when they get their full-term bumps! Thank you for the tutorial–it’s great!! Thank you, thank you, thank you! I have been wanting to do a picture like this for quite some time and I am so thankful to have found this tutorial! I edited mine a little different (like you said- do it how YOU like it) and I am just in love with the outcome. I can’t believe I was able to do it alone, too! I was wondering if propping my phone up would work, but it did! Thank you!!! You can see my picture at the link below. Excellent tutorial/suggestion of apps! Used it today for a tiny maternity shoot with my little one. Thank you! Wow! Thanks for the step by step tips instead of just naming the apps. I have both apps and wasn’t sure what you would’ve done in after light for editing. This really helps! Thanks so much for this tutorial! I took a few today of myself like yours and included big brother for one too! Love how they came out!! I hope your able to view the pics using this link. I love the ones with my daughter! You have given me such a gift! i’m going to try this before we lose all our sunlight (and before baby comes). i have gotten a lot of compliments on this shadow image i shot with my 2-year-old, but upon looking closely, i would’ve held the camera elsewhere so it’s not visible next to my face and framed the photo w/o the grass. but i’m far from a pro. Cute picture! Thank you so much for sharing. I have been wanting to do this. Thanks for this great tutorial. I first came across the original photo awhile ago and thought, “Oh, wouldn’t it be nice to find a photographer who could take this kind of photo of my pregnancy.” But now I can have my husband read your tutorial so he can be the photographer. So thanks again. You inspired me! I gave this my best shot in my little poorly-lit basement apartment and was pretty happy with the results even though it’s not exactly a silhouette. Check it out if you have a free sec! Great site! Love this tutorial! Any tips on the first picture? I’m following your instructions but I’m not getting the blown out look. Thanks for sharing! Pinning this! You look so good! I love how this picture turned out. 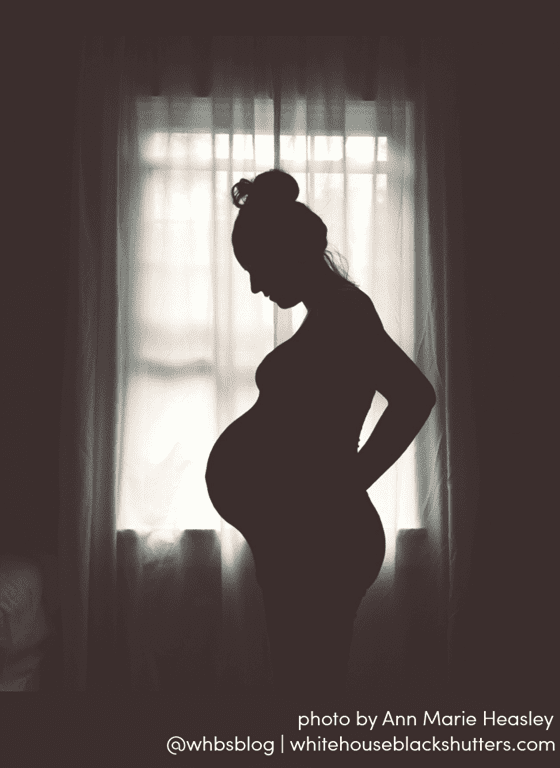 I can not wait to see that baby! Love this tutorial Ann Marie and I love that you did this all with your phone!!! YOU are gorgeous!!! Very pretty Ann Marie! Thanks for the tips on how to take one yourself. 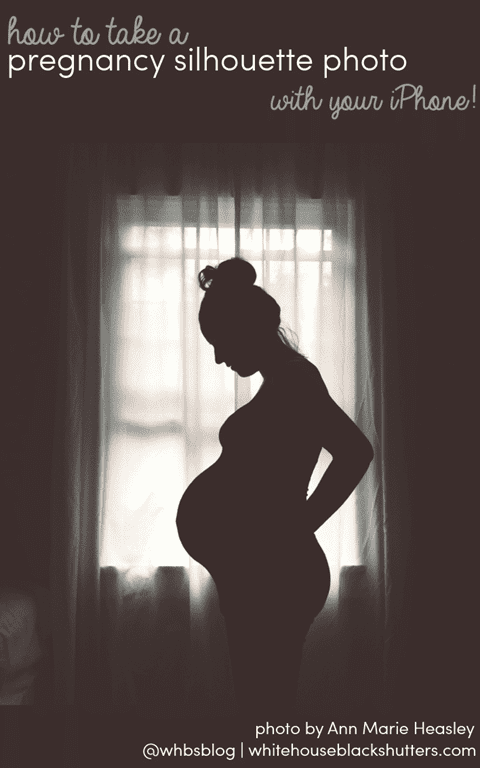 When I was pregnant with P, my photographer took a silhouette shot of me during my maternity pics.